The Amazonian rainforest is a lush region, mysterious and interesting, and the most diverse ecosystem in the world. 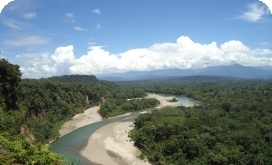 Students will find an abundance of vegetation, as well as beautiful animals, roaring rivers, and different indigenous groups still living in the area and still practicing ancient customs, like natural healing and medicine. Medicinal Plants/prepare chocolate and Spanish classes. Hiking in the jungle and waterfall. Canoe trip/visit indigenous comunities/wildlife museum. Return to Quito in the afternoon. Included in program price are: accommodation, food, drinks, guides, 18 spanish lessons and the activities mentioned in the schedule. Not included: Transportation, drinks (beer, wine and similar), tips, etc.